Did you know that quiet influencers and introverts use social media in a very thoughtful way to challenge the status quo, provoke new thoughts, inspire others and create change? But it is easy to get overwhelmed. Social media overload can feel like a never ending river of information. Because there is no end in sight, it is hard to limit your time and create a workable schedule. If you don’t, you will get stressed out before you’ve found the nuggets you need to formulate your influencing plan. To help address this problem, I invited my friend Corey Perlman, author of the new book Social Media Overload! to share his thoughts on the mistakes individuals and businesses typically make with social media and how to avoid them. His ideas are relevant if you are an individual or a business. 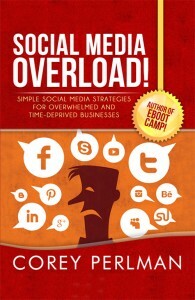 Excerpted from Social Media Overload! A successful social media strategy can deliver results far beyond just generating new leads. It can help you strengthen credibility when decision makers are kicking your tires online. And while they’re in research mode, It can keep you ‘top of mind’ until prospects are ready to buy. Social media can also help you strengthen relationships with customers and enable them to become a powerful referral network for your business. But most companies fail to see these kind of results because of the critical mistakes I’ve outlined below. Review the list and see if there are areas where you can improve and take your digital marketing to a higher level. Where are your customers and potential customers spending time online? Are they active on Twitter? If not, why should you be? You don’t have to be on all social media sites. REPEAT: You don’t have to be on all social media sites. Decide where your audience is spending time and plant your flag on those sites. If you’re typically targeting businesses, LinkedIn is probably the place you’ll want to spend the most time. With over a billion users on Facebook, chances are good that some of your prospects are active on that site. Nothing kills credibility faster than an untouched profile. I’d rather you delete the profile than let it sit stagnant with few followers or connections. Action: Take inventory of all of your social media profiles. Create a plan to consistently update them and build a following. Take advantage of sites like hootsuite.com that will allow you to schedule posts on dates of your choosing. If you decide it’s not worth the time or resources, delete the profile. 3. Not taking advantage of LinkedIn as a sales tool. I hate cold-calling. Early in my career, I figured out I was terrible at bypassing gatekeepers and getting myself in front of decision makers. I had to find a better way. And I did so by using the Get Introduced feature on LinkedIn. It allows me to turn cold calls into warm leads. Simply look for potential decision makers that have a number two next to their name. That means they know someone who you know. LinkedIn is gracious enough to let us know who that mutual connection is and they facilitate a way for the mutual connection to introduce us. As an example, say I found Sally Smith, President & CEO at ACME Enterprises. She has a number two next to her profile and LinkedIn tells me that our mutual connection is Steve Morrison. I’ve done work with Steve in the past, so I reach out to Steve and ask him about his relationship with Sally. Lucky for me, he knows her quite well. I then request that Steve INTRODUCE me to Sally. He does a marvelous job of setting me up as an expert and even I couldn’t screw up the sale. It’s my favorite feature on all of social media and I hope it benefits you greatly! What could you share or write about that your customers and prospects would deem interesting or valuable? You should ask yourself this question before you share anything on social media. It doesn’t matter the channel. It could be your blog, Facebook page, LinkedIn profile or Twitter feed, I want you sharing information that will benefit your audience. Over time, you’ll start to build trust and credibility with them. This is, by far, the most effective way to sell your value and yourself. If you deliver this great material on the web, imagine what they’ll get by working with you. Remember to always Make It About Them. It’s the golden rule to seeing results with social media. Remember to always Make It About Them. It’s the golden rule to seeing results with social media. This entry was posted in introvert and tagged Corey Perlman, jennifer kahnweiler, Linked In, social media on August 25, 2014 by Jennifer Kahnweiler.